The Company is a family business in Western Kenya started in Kanjira (Karachuonyo) in the mid 1920s producing under 5 tonnes of Hydrated Lime per day. 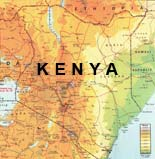 In 1938 it moved to Kowuor, near Homa Bay and was incorporated as a limited company. Production increased to 10 tonnes per day. In the early 1950s, land was acquired here in Koru, and a new factory built with a capacity of 90 tonnes per day. Limestone quarrying and lime processing. Click here for How To Get To Homa Lime Co. Ltd.